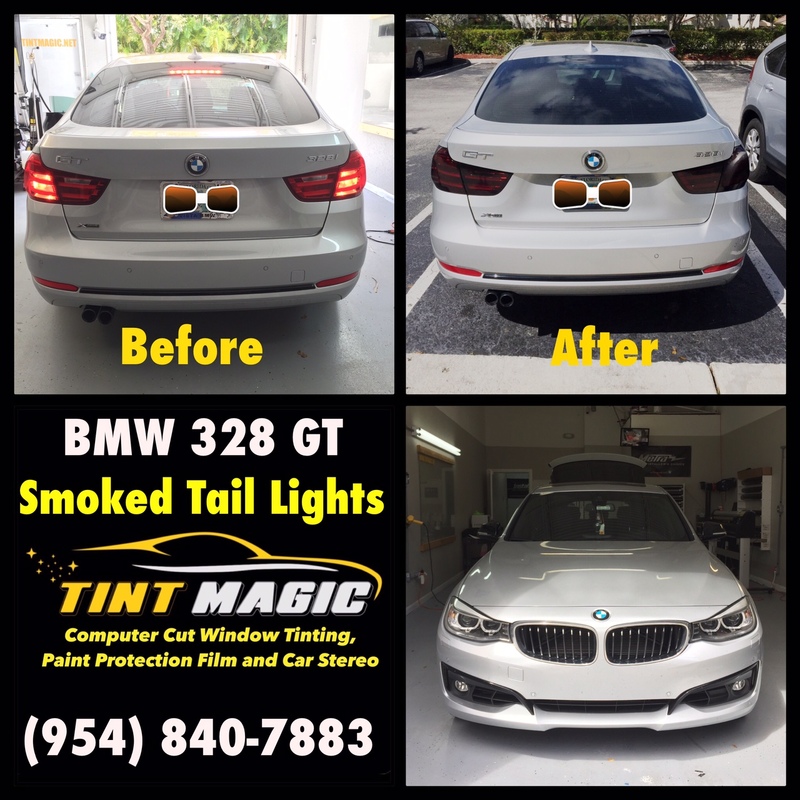 BMW 328 GT Smoked Tail Lights at Tint Magic Window Tinting Coral Springs. Call us for a free estimate! (954)840-7883. we are located at 11344 Wiles Road Coral Springs, Fl 33076. The 2016 BMW 3 series Gran Turismo is the 3 Series that doesn’t get all the glory. As a sport sedan,BMW’s grand creation has become an icon and a cultural reference. But when it’s stretched a little and given a hatchback body style, well, its appeal becomes more limited. Despite this somewhat awkward styling, those who take a more pragmatic approach might find that the 3 Series GT will make a lot of sense. Having said that, one thing that doesn’t make much sense is the Gran Turismo label itself. This term is usually associated with exotic sports cars, not luxury hatchbacks with all wheel-drive. But there’s a precedent: The 5 Series Gran Turismo hatchback has been around for a few years, having carved out its own little niche as a versatile 5 Series variant. The 3 Series Gran Turismo is simply a smaller, more affordable application of the same basic concept. Other than being a relatively high-riding all-wheel-drive hatchback, the 3 Series GT is pretty much like any other 3 Series. Power comes from either a turbocharged 4-cylinder engine (328i) or a turbo inline-6 (335i), both of which are borrowed from the sedan, and the equipment list is similar. The 335i model gets keyless entry/ignition, power lumbar adjustment and a Harman Kardon audio system as standard. The whole range now has 18-inch alloy wheels, satellite radio and an alarm system as standard. The self-parking feature can now handle perpendicular spaces. The previously optional Sport Line cosmetic package is also standard, while other option bundles have been renamed and tweaked.